Largehearted Boy: Book Notes - Idra Novey "Ways to Disappear"
Book Notes - Idra Novey "Ways to Disappear"
Previous contributors include Bret Easton Ellis, Kate Christensen, Kevin Brockmeier, T.C. Boyle, Dana Spiotta, Amy Bloom, Aimee Bender, Jesmyn Ward, Heidi Julavits, Hari Kunzru, and many others. 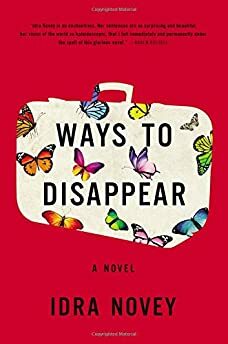 Idra Novey's Ways to Disappear is thoroughly engaging and thought-provoking, and is one of the year's strongest debut novels. "Poet and translator Novey's briskly paced first novel is a clever literary mystery and a playful portrait of the artist as a young translator…it reads like an Ali Smith novel with a fun Brazilian noir vibe. But underlying these comic noir elements is an eloquent meditation on the art and anxiety of translation, as well as a story about literature as a means of revelation and concealment." Stream this playlist at Spotify. While writing this novel, I often turned to music to figure out the mood and rhythm of a scene. I came to fiction from poetry and translation and in both cadence is everything. The driving rhythm and feisty lyrics of singer-songwriter Valerie June were especially essential to the mood of the book. As a nod to her influence, two of her songs bookend the list below. Like June, I grew up in Appalachia and have a deep devotion to bluegrass guitar. The novel begins and circles back to Pittsburgh, which was the closest major city to the tiny dying town where I spent the first 18 years of my life until I fled to New York. The rest of the list, after Erin McKeown, consists of the Brazilian music that accompanied me while returning in my mind to the streets of Rio and Brazilian islands central to Ways to Disappear. This song kept me defiant during many moments of writerly doubt. I was determined to subvert some of the notions I'd learned about how a novel should proceed and this song kept me true to that intention as I sat on the couch at night deliriously trying to keep on with this book. This song is a sly subversion of a nursery rhyme. McKeown adds feminist subtext to blackbird pie like no one else I know. I cranking up the volume on this song many times during the six years it took to complete this first novel. Bahia is a state in the north of Brazil with so many talented music makers right now they deserve a playlist of their own. But Baianasystem is my favorite. While editing this novel and also when running late for my commute, Playsom has been an essential soundtrack. Maria Gadú and Leandro Leo are so elegantly in sync in this song. Their generous collaboration and awareness of each other's voices is like the best author-translator relationship. Or editor-writer relationship. I've had the excellent luck to have experienced both. I've played acoustic guitar off and on since high school and am a devoted listener to many finger-picking virtuosos but Fabiano do Nascimento has got to be among the most nimble-fingered living guitarists on the planet. I listened to this song in particular over and over while trying to keep both mind and fingers nimble during the many drafts that fiction requires. Maris Monte is a legendary figure in Brazil and I've been singing this song of hers for over a decade. I felt strongly that this song needed to appear in the novel but wasn't sure where. In the end, it found its way into one of the darkest scenes and sung badly by a stranger in the shower. But it's in there, as it had to be. Vitor Ramil plays with the music of the Portuguese language in such an exquisite way. Even for listeners who can't understand the meaning, the sonic play in this song is still as delicious to the ear as a line of Emily Dickinson. The ending of this book took quite a long time. I suspect it was the tone and wistful yet defiant lyrics of this song that finally got me there. Despite all my years of traveling and translation, there is no escaping the grip of Appalachian bluegrass and a whole childhood imagining Pittsburgh as the cosmopolitan center of the universe. Thank goodness for Valerie June.